The Council is composed of 19 faculty members, 11 of whom are regular faculty, and 8 are adjunct faculty, effective Fall 2012. All members have equal standing with respect to voting and bringing issues to the Council. Elections for vacant seats (approximately half of the Council) occur each Spring semester. Term of office is 2 years. Any faculty member who is currently an active, dues-paying AFA member and has been for the past five months is eligible to run. All dues-paying Members of AFA are eligible to vote in AFA representative elections. 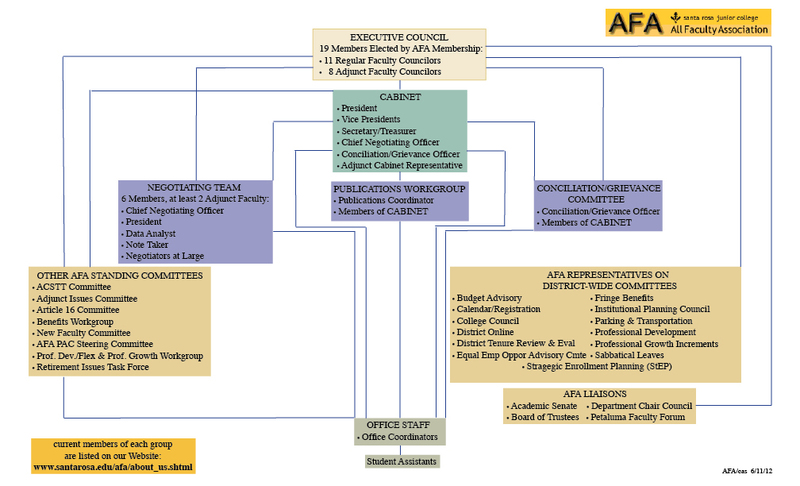 Contract faculty Members elect contract faculty representatives; adjunct faculty Members elect adjunct faculty representatives. The Council holds regular meetings on the second and fourth Wednesday afternoon of each month during the Fall and Spring semesters. A special meeting of the Council may be called by the President, by a Vice-President, or by three Councilors. There is at least one General Meeting each semester. Officers are elected by majority vote of the Council. President must have served as Council member, or Negotiations Team member, or Conciliation/Grievance Officer for at least one year to be eligible. President is on the Negotiations Team by position. There is no limit on consecutive terms of office. Appointments of other positions do not necessarily need to be filled by Executive Council members. * The first terms of the President and Chief Negotiating Officer shall be two years, and their subsequent terms shall be one year. AFA Bylaws Article III Section 3.